Today when i woke up, i found that whole of my Fb timeline is full of status about Whatsapp Web Version. Everyone is posting their status about this new release of Whatsapp Browser Version. But when i move to Whatsapp site, i found that it require some initial setup to start with Whatsapp on your web browser. So i thought of posting How to use Whatsapp Web Version, so that it will be easy for you to setup Whatsapp official web client. This is the most awaiting feature of Whatsapp, that people are eagerly waiting for. As such there are many web clients for whatsapp, there are lots of software and tools that allow you to run Whatsapp on pc but all of them have some bugs, some are slow or some have some limitation. But with this new official update, everything would be perfect. 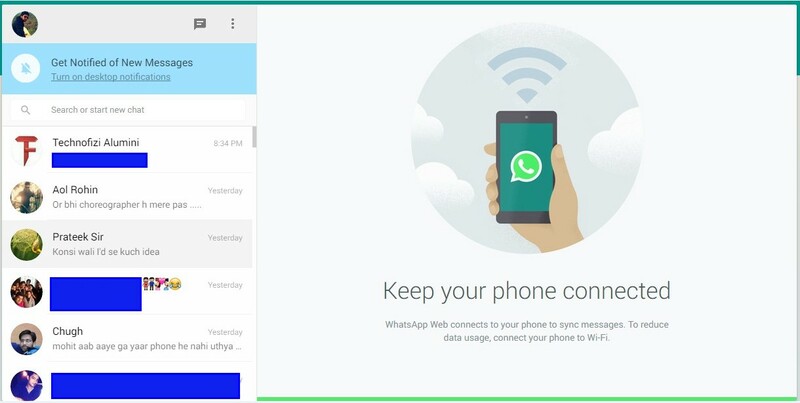 Now you can easily sync your Whatsapp to pc. And both your mobile version and Web Version will remain sync. So if any message or anything comes to mobile version, it will also get reflected to your web version or if any message comes to web version it will get update on mobile version in real time. What is the main use of Whastapp Web Version ? We all are happy with this new web version of Whatsapp, but we don’t know Whats its main purpose. How it will help you, its limitation etc. Well many time when i worked on PC or Laptop and also chatting on Whatsapp. I found it little uncomfortable to operate both device simultaneously. As i have to pick my mobile again and again to check the messages and that disturb my work. But with this new browser version of Whatsapp. I can operate my Whatsapp right from my desktop or pc. I just have to keep open one tab in my chrome browser. It will be very easy to switch tab while working. So now i can work and chat together. Now with this new web version, i can easily attach any file , photo or video directly from my pc and can send in chats. Earlier i have to connect my mobile to pc and transfer the files to mobile and then i was able to whatsapp them. But now i can simply send any files directly from my pc. I can also use my web cam for capturing photos. And one more profit of this version is that i can easily download any photo or files from my whatsapp chat to my computer. To use this Web Version of Whatsapp, you must have active account of Whatsapp on your mobile. As your web version and mobile version are sync in real time, your phone should always be connected to internet. If you thinking of switching off your data pack on mobile and then only using Whatsapp on PC, then it would not be possible. You must keep both mobile and PC connected to internet. 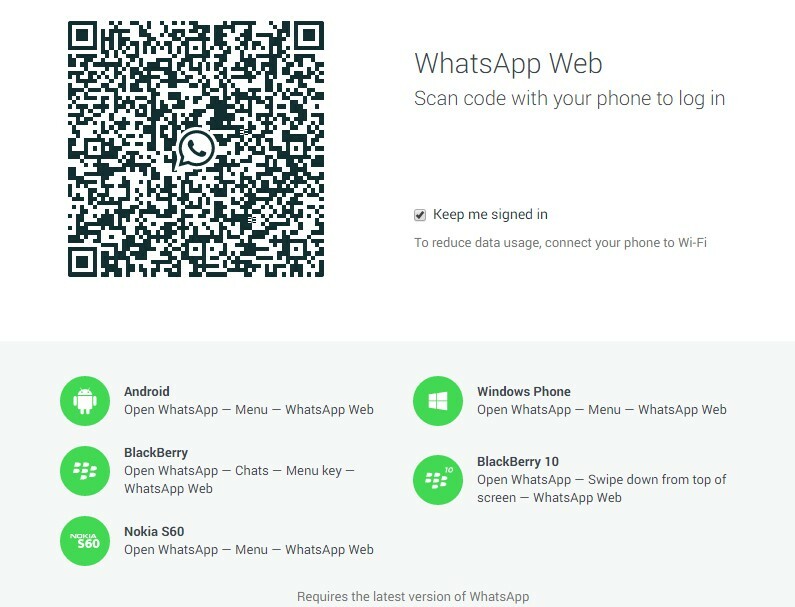 So you can not use Whastapp Browser version, if you do not have active mobile version of Whatsapp. Many people Who don’t have smartphone might be thinking of using Whatsapp web version. But let me clear out , if you don’t have Whatsapp on your Mobile, you can not use Web Version of Whatsapp. You guys still have to stuck with those third party tools and application to use Whatsapp messenger on PC. So now you want to use this new feature of Whatsapp, Well as i discussed earlier to use this Web Version of Whatsapp, there are some requirements. Like it only works on Chrome Browser, You must have active Whatsapp Account and it should be connected to internet all time. And you must have latest version of Whatsapp on your mobile, if you don’t have just go to your App store or Whatsapp.com and update your Whastapp. Step 1: Open Chrome Browser in your PC or MAC. Step 2: Open https://web.whatsapp.com/ in your chrome browser. It will display a QR code , that you need to scan with your phone. Step 3: Now open Whatsapp in your Smart Phone. Now it will automatically turn on your Mobile Camera. 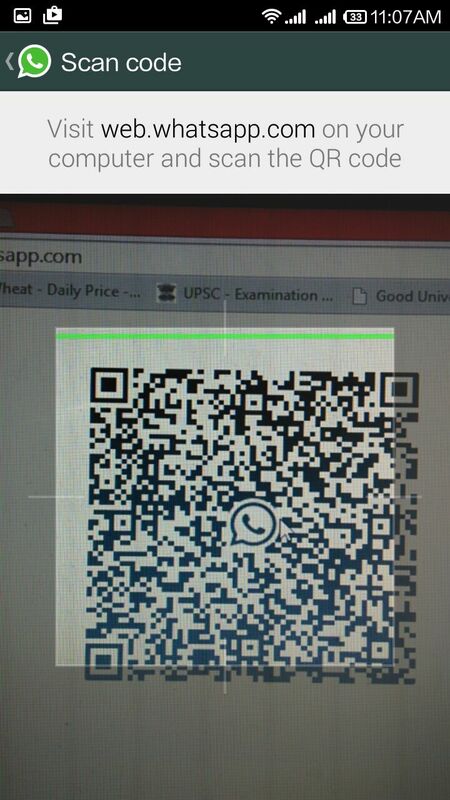 Step 4: Now Scan the QR Code from your chrome browser in PC with your Mobile Camera. It will automatically log in to your Whatsapp account. Now you can use Whastapp right from your browser. Both your mobile and pc will be sync in real time. So you don’t need to worry about chats that you have done in web version, they will automatically get sync to your mobile version. 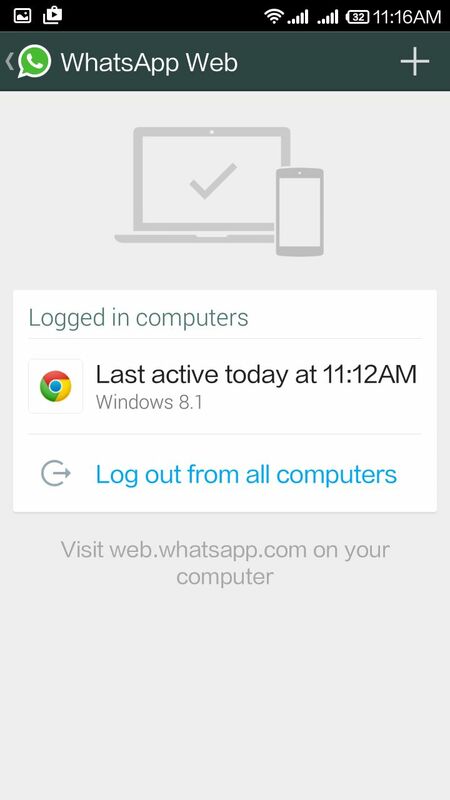 And once you log in to your whatspp on your pc, it will keep it records or cache on Pc. So you don’t have to perform this scanning step again and again. Even if you close the tab, you can reopen it and you will find your whatsapp account logged in. You can also use it simultaneously on more then one pc. 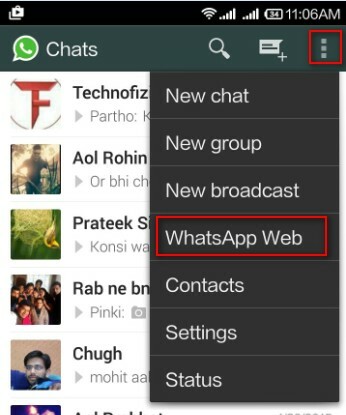 So to use Whastapp on more then one system, simply tab the Whatsapp Web option in your phone Whatsapp. Then tap the + or Add button. It will start the camera , then follow the same procedure, scan the code and it will logged in. And if you wish to log out your Whatsapp account from browser or PC. Simply touch the Log out From all Computers. You can also Turn on Desktop notification on your Browser. For this simply click on Turn On Desktop Notification option in your browser. It will ask you permission, simply click on allow. Your desktop notification will get turn on. Or if you want to send any image from your Pc to Whatsapp, simply open the chat and click on Attatch icon. Then on image icon, now browse images from your pc and click on open. It will upload your image file, then click on send icon. Or if you want to download any image or video from your Whatsapp chat to your PC. Simply open that chat in your browser. Then click on that image, now click on download button on top right corner or right click on image >> then Save Image As option to save that image on your pc. So this is all that you can do with your new Whatsapp web version, so you have now learned how to use Whatsapp web version, now enjoy this Whatspp Browser version and also share it with your friends. I will also come up with the video on How to setup and use Whatsapp Web version soon.